Lamb’s Grill Cafe has been an important downtown restaurant since 1919. Besides the excellent menu fare, Lamb’s has provided a convenient place to conduct business in Salt Lake. 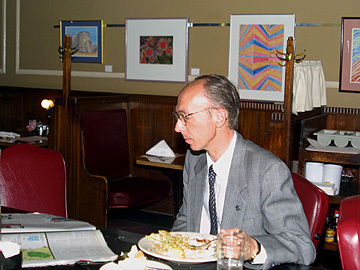 Over the decades, many an important business deal or legal agreement has been hammered out over lunch or dinner there. For the past three years, it has also been an important alternative venue for local artists. It all started when owner John Speros was taking classes and workshops from the Salt Lake Art Center’s Photography Department. A serious photographer himself, Speros was impressed by the work of the other photographers in the group and it dawned on him that most of their beautiful work was not being shown. So, with plenty of wall space in his restaurant to offer, Speros began hanging their work. The experiment has evolved into a very successful practice for both Speros and the artists. Today, Lamb’s hangs all kinds of fine art, mainly from Utah artists. Exhibits typically hang for one calendar month and usually feature an opening, with snacks and refreshments provided by Lamb’s. Sales are frequent, and Lamb’s takes a modest 25% commission. May features the photography of Robert Barberio. During June, the Salt Lake Photo Print Society will display a group show of their members’ impressive work. The Rock is Back! Or is it?